Earlier this week a Bloomberg report suggested Apple was working on – or at least considering – a curved screen iPhone. Unlike Samsung’s phones, which curve down on the sides, this theoretical iPhone would curve inwards, like a banana. This is a great idea. Apple would be far from the first to use such a curve, but since the tech has fallen out of favor in smartphones, it’s a good time to bring it back. A curved screen is less likely to scratch and more likely to survive a bad drop than a flat screen. It’s pretty obvious when you think about it. If you set a flat screen on a table, the entire glass surface thing is at the mercy of any material that could scratch it. Even if it’s just a mild curve, only the top and bottom edges would be in contact with a flat surface. I distinctly remember that past curved devices I’ve tested were far less prone to scratches. No risk of scratching most of the display, even when set down on concrete. The same goes for drops; while any bad drop could shatter glass, a curved phone would be less likely to crack due to landing on some small protrusion on the ground. A banana-shaped iPhone would also help ensure you won’t drop your phone in the first place. The curve would fit the contours of your hand better, for one. Go ahead and pick up your phone. Notice the big gap between your palm and the back of the device? That means that only your fingertips are really keeping a grip on your phone, wasting valuable surface area that could increase friction and make your future iPhone more secure in hand. It also just feels nice. A curved screen can significantly reduce the distance your thumb has to travel to reach the top of the screen. Again, a curve naturally follows the arches of your hands, which aren’t designed to interact with a flat slab. This would make it easier to reach UI elements near the top of your screen. 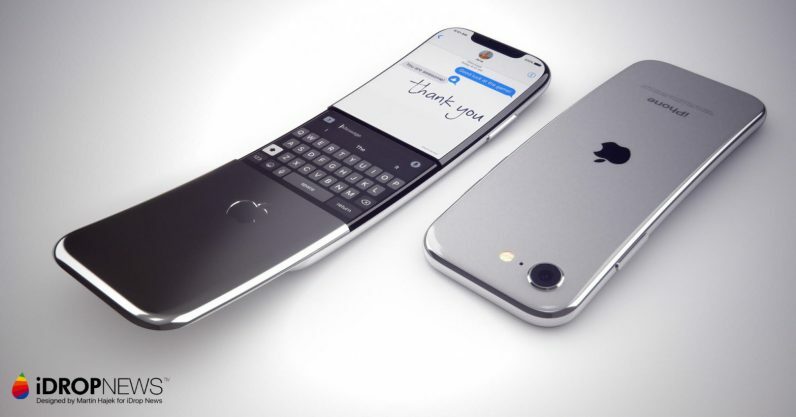 Considering Apple is rumored to be working on a 6.5-inch iPhone, a curved display could go a long way towards making it more comfortable to use with one hand. The G Flex 2 may have been ahead of its time. There’s another small bonus: A curved screen would help FaceID recognize you when the phone is lying on a desk, as the camera would be angled towards your face. That should appease some of those who miss TouchID. While the hype over curved TVs has gone down, curved displays can make for a more immersive viewing experience as they naturally follow your field of view. This is most effective on either extremely large displays (say, an IMAX theater), or a screen that’s very close to your eyes (like a computer monitor). The latter scenario also applies to phones. Now that phones commonly approach or exceed a six-inch diagonal, people are more likely to view entire episodes and even movies on them. A mild curve could go a long way towards creating a more immersive experience, especially on the rumored iPhone X Plus. The design could also help reduce glare from sunlight when used outdoors. Again, Apple isn’t inventing curved smartphones, but the company is rarely first. Instead, Apple tends to introduce technology others pioneered when it feels it can perfect it. That could happen with curved displays. For reference, the Google/Samsung Galaxy Nexus was one of the first phones with a curved panel, way back in 2011. LG had some of the most dramatic examples with phones like the G Flex several years ago. But they eventually fell out of favor, in part because OLED wasn’t really mature. This was back when the technology wasn’t categorically superior to LCD and the displays were prone to ridiculous over-saturation and dramatic burn-in. Introducing a curved design just added extra complications. Times are different now. Apple, which always favored LCD, moved onto OLED with the iPhone X, and is rumored to be working on its own display technology. It would also give Apple a design advantage. While the notch was a unique detail at first, it’s already become routine. As hard as it might be to divorce the image of an iPhone from that of a flat slab, lets not forget Apple used to make computers that looked like this. Now that bezel-less phones have been achieved, I’m ready to move onto bolder designs. A concave iPhone could help Apple stay ahead of the curve. Pun intended.